I never had a list of wishes but like everybody I also have few wishes and one of them was to travel via Airplane✈. Now you will wonder what wish I had because it’s not a big deal now. Today this is so common to travel by plane. But when I was in my childhood or in 90s it was a wish of many. Due to high flight’s fare and less options it was not possible for everyone to take advantage of airline facilities. Now there are many private airlines companies who are giving many offers to their customers every day and due to the increased competition their fares are bearable too. The living standards of people have also been raised compared to the time of 90s. So I wanted to travel in flight but not in day time. I used to see planes flying in quiet sky at night with that blinking lights and I always wanted to be a part of it to experience that quietness of dark sky and to see those little sparkling lights on earth far above the sky. Last year, on 27th February 2017 I got married and within one week of marriage I and my husband shifted to Bangalore. Finally my wish is going to be fulfilled as we are travelling to Bangalore by Flight but it was a day flight. I was not that much excited what I used to be. It was a normal day for me though everything was new. Luckily we had a window seat and that was mine, of course 😉lol. The flight was about to take off, I fastened my seat belt and ready to fly. My husband looked at me and started to smile as he knew it was my first time. Aeroplane started running on platform and soon it was half in the air and then I felt some butterflies in my stomach as if I am taking a roller coaster ride. The same thing happened while landing too. Well, after some time the plane was still and I felt air pressure in my ears. I was almost deaf and bored now. I had to be like this for next 2 and half hours. 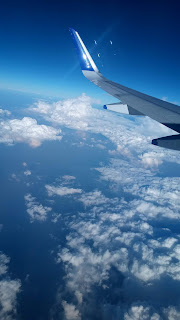 I forgot that I was seating in window seat but when I realized that there is something interesting to see out, I took my phone started taking pictures and videos. It was a beautiful view; soon we were surrounded by white clouds, like we were in heaven. We were about to land and it started raining. Oh, I forget to tell that the trip was Delhi to Bangalore. Delhi and Bangalore both look very different from sky. Well, my first experience by flight was good and yes, my wish to be in plane at night has been fulfilled last time when I traveled by flight and it was the same as I was assuming it would be.